"This is a great dessert for the holidays. 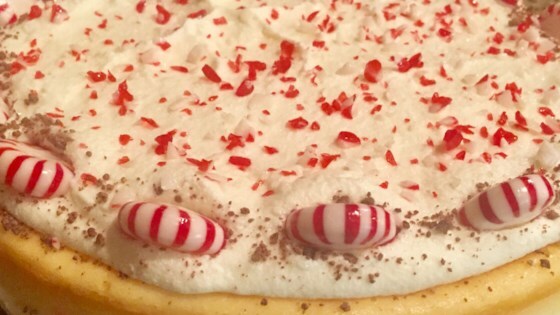 Garnish with whipped cream and crushed peppermint candy." Stir cookie crumbs and margarine in a bowl until evenly moistened; press into the bottom of a 9-inch springform pan. Bake in the preheated oven until lightly darkened, about 10 minutes. Remove from oven and cool to room temperature; about 30 minutes. Stir gelatin and cold water in a small saucepan over low heat until gelatin dissolves completely, about 3 minutes. Beat cream cheese and sugar with an electric mixer in a large bowl until smooth. Gradually add gelatin mixture, milk, and peppermint candy; mix until well-blended. Chill filling until thickened, about 2 hours. Fold whipped cream and chocolate into filling. Pour filling into crust; chill until firm, about 1 hour. Easy to make and was tasty, but I didn't care for the gelatinous texture. I prefer baked cheesecake, but the kids did enjoy this. Cheesecake soup. Recipe is wrong, I followed it exactly, it is soup, and even if it worked, there are not enough ingredients to fill my spring foam pan. It had no flavor and I will never make this recipe again.